Every Autumn the food bloggers go a little crazy over pumpkin. Just check Foodgawker this time of year and you’ll be bombarded with all kinds of questionable pumpkin concoctions. Personally, I’d like to get on board with the experimentation but my (British) husband simply refuses to even look at it whilst in the grocery store. However, I have my ways and found recipes that even he, a pumpkin-hater, would eat. One amongst these recipes is pumpkin tempura because who doesn’t like crispy fried pumpkin resembling steak fries? Pair it with a soy and chili sauce and it’s down right addictive even for the non pumpkin enthusiasts. Wash and dry pumpkin. Scrape out the inside seeds and pulp with a spoon. Peel the outer shell off (optional). Cut pumpkin into thin slices no wider than 1 cm (0.5 in) wide. You can cut it thinner or shorter if you like. The preference is yours. In a large wok or fryer, add a generous amount of oil and cook over high heat. Fill up a ziplock bag halfway with water and freeze overnight. If you didn’t plan ahead of time, no problem, just put a bunch of ice cubes into a ziplock bag. In a large bowl, mix 2 cups of chilled water with 1/2 tsp sea salt. Sift in the flour and lightly beat with a fork or chopsticks. Lightly beat two eggs together in a small bowl until just combined. Add ziplock bag of ice to tempura batter to keep cool. When oil is hot, add sliced pumpkin to batter. Dip sliced pumpkin in batter and gently add to hot oil to fry (be careful not to burn yourself). You will know when the oil is hot when it rapidly sizzles when a drop of batter or the tip of wooden chopsticks are added to it. If you are frying tempura in batches, remember to let the oil rise in temperature before adding more. Adding cold tempura to the hot oil decreases the overall temperature of oil so always keep at high heat and remember to remove the free floating drops of batter from the oil before frying a second or third batch. Try not to mess with the pumpkin too much and simply allow it to bubble away in the sizzling oil. Turn if necessary. Depending on temperature of oil, frying can take 5-7 minutes. When nice and crispy, remove pumpkin tempura with a slotted spatula and let excess oil drain off on paper towels. Serve when fresh and hot with your favorite dipping sauce. You can use the traditional tentsuyu sauce for dipping but I found that this soy and chili sauce compliments the pumpkin well with its notes of salty, sweet, tart and smokey chili. Serve with crispy tempura and enjoy. Wash and dry pumpkin. Scrape out the inside seeds and pulp with a spoon. Peel the outer shell off (optional). In a large wok or fryer, add a generous amount of oil and cook over high heat. Fill up a ziplock bag halfway with water and freeze overnight. If you didn’t plan ahead of time, no problem, just put a bunch of ice cubes into a ziplock bag. In a large bowl, mix 2 cups of chilled water with 1/2 tsp sea salt. Sift in the flour and lightly beat with a fork or chopsticks. Lightly beat two eggs together in a small bowl until just combined. Add beaten eggs to flour mixture and mix together until everything is just combined (about 2-3 whisks) Add ziplock bag of ice to tempura batter to keep cool. When oil is hot, add sliced pumpkin to batter. Dip sliced pumpkin in batter and gently add to hot oil to fry (be careful not to burn yourself). You will know when the oil is hot when it rapidly sizzles when a drop of batter or the tip of wooden chopsticks are added to it. If you are frying tempura in batches, remember to let the oil rise in temperature before adding more. Adding cold tempura to the hot oil decreases the overall temperature of oil so always keep at high heat and remember to remove the free floating drops of batter from the oil before frying a second or third batch. Try not to mess with the pumpkin too much and simply allow it to bubble away in the sizzling oil. Turn if necessary. Depending on temperature of oil, frying can take 5-7 minutes. 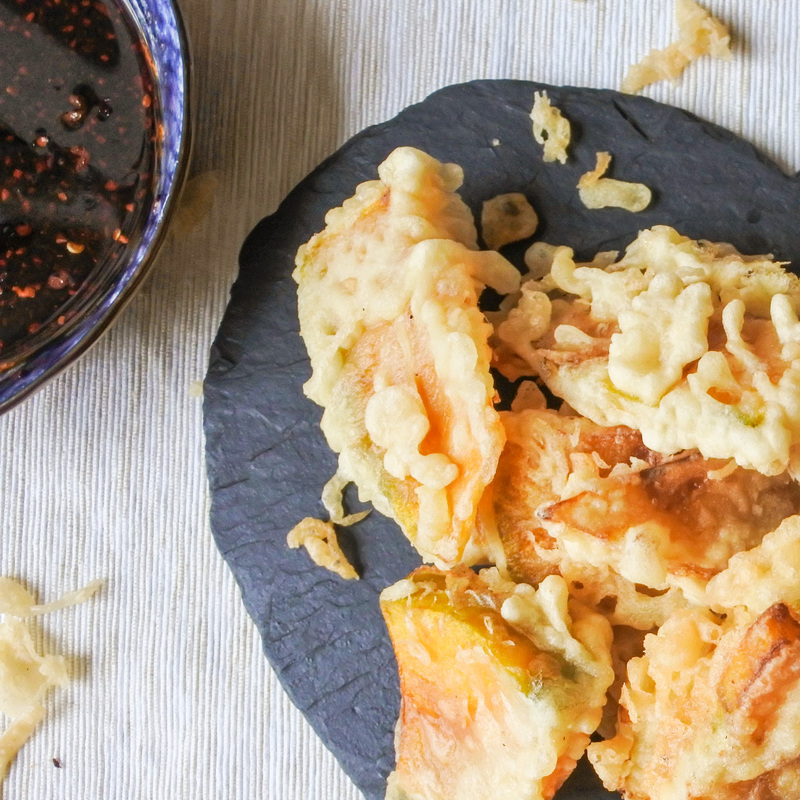 When nice and crispy, remove pumpkin tempura with a slotted spatula and let excess oil drain off on paper towels. Serve when fresh and hot with your favorite dipping sauce.